Livestock owners know that a lot of thought and work goes into keeping animals healthy. One of the best actions to take is regular de-worming. Your veterinarian can prescribe chemical wormers for your goats, or you can take a more natural approach. Purchase an herbal preparation at the local co-op, or supplement your herd’s diet with a mixture of your own design. Depending on the type of parasites your goats tend to contract, there are several herbal remedies to choose from. Add a few herbs together to make a good overall de-wormer you can use on a regular basis. Check goats for signs of parasites. CritterChat.net states that signs of infestation include white rice-like segments or live worms in stool, pot-bellied appearance, rough coat or weight loss in spite of sufficient food intake. Purchase bulk ground herbs from a reputable local health food store, co-op or online. Be sure the pumpkin seeds are raw, and not the roasted salted snack. Mix ground walnut hulls, pumpkin seeds, parsley, garlic, and Pau d’Arco in the large bucket. Add a handful of the mixture to a trough full of feed to serve several goats. Each goat will need to eat some of this to prevent the parasite from passing back around. Repeat this daily for one to two weeks to ensure the elimination of all parasites. Add hay or other roughage to their diet to help eliminate the killed worms. Prevent recurrence by allowing free-range feeding of some general anti-parasitic plants. Plant garlic, parsley and wormwood (the milder varieties like Sweet Annie) so your goats can graze on them. 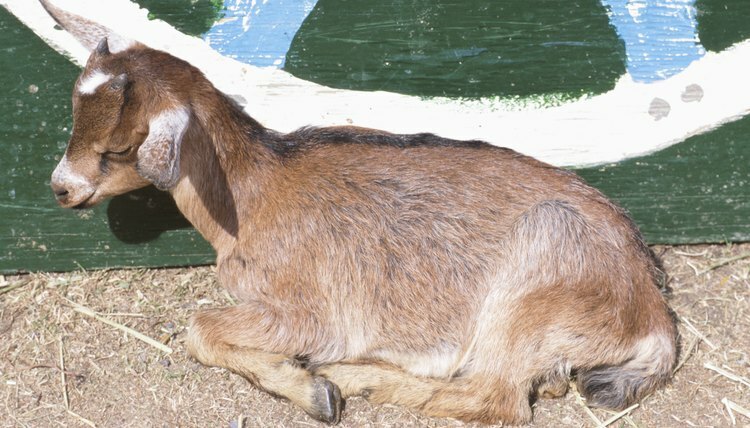 The best prevention for parasites, including worms, is to boost the overall health of your goats. Only feed them good quality materials, and supplement with minerals when needed. If you are inexperienced with parasitic infestations, seek the advice of your veterinarian before diagnosing or treating your goats. Let him rule out any other possible medical cause for their condition until you are more familiar with the signs. Theresa L Johnston is a Southern writer with expertise in alternative medicine, gardening and behavioral and women's health issues. She has been published at http://www.ehow.com, in "The Mostly ARTzine," and has edited several newsletters. She has written procedures manuals, call scripts, and youth group curriculum for her various employers over the last 10 years. What Do You Feed a Cow That Doesn't Have Much Pasture? Are Sheep or Goats Better Weed Eaters?